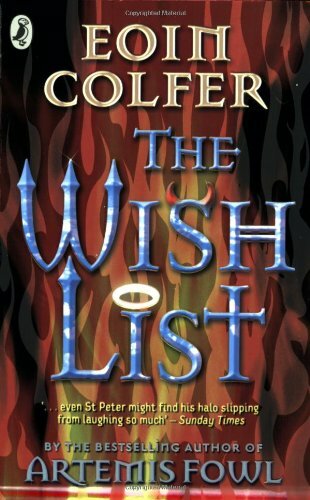 by Eoin Colfer | Children's Books | This book has not been rated. MEG FINN IS IN TROUBLE UNEARTHLY TROUBLE. Cast out of her own home by her stepfather after her mother's death, Meg is a wanderer and a trouble maker. But after a botched attempt to rob a pensioner's flat, Meg, along with her partner in crime, Belch, ends up in a very sticky situation. Meg’s soul is up for grabs as the divine and the demonic try every underhand ploy imaginable to claim it. Her only chance for salvation is helping a lonely old man complete the tasks on his wish list. But how can she persuade pensioner Lowrie to help her when she has wronged him? And even if she can persuade him, will she really have enough points to face up to Saint Peter? Cover slightly different from that shown. An intriguing and musing read, while it provides quite a number of challenging issues to chew on, in the form of a whole lot of tricky grey areas, there are also the straight black and white issues of good and evil actions to consider. So an everyday tale of neglect, betrayal, revenge, re-assessment and redemption. Meg is vulnerable, angry, reliably feisty and bright as a button while Belch is an unprincipled yet almost loyal, slug with street smarts. How can they hold out against the vile trickery of the demonic forces eager to recruit them. Read another copy of this book years ago I realise (around 2009?) so was surprised to find this is the first copy I have BookCrossed. Hum, maybe I borrowed that first copy from a chum who has a slew of Eoin Colfer books as she is a great fan of his and no wonder his novels make compelling reading. Hoping your find some interested readers for these Haugtussa, kind regards rainbow3.